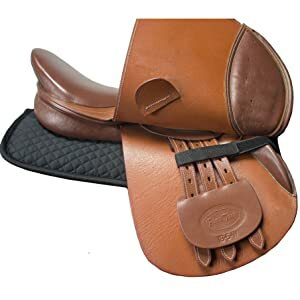 Derby Originals Contoured Correction All Purpose Quilted English Half Saddle Pad with Therapeutic Removable Support Memory Foam Pockets for all Disciplines is made with innovative design components to provide ultimate comfort for all equestrian enthusiasts. Both horse and rider will feel instant relief during any type of riding with this pad with its key design elements. 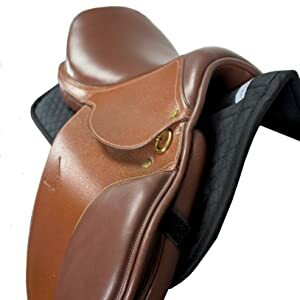 The half pad features a top layer of diamond quilted pattern, cozy cotton material, an underside featuring smooth, soft brushed cotton, four sewn Velcro closure's that contain removable memory foam inserts to provide shock-absorbing protection, contour shape for the ideal fit under the saddle and on your horse's back and withers, and Velcro billet keepers to prevent any tack shifting. This pad can be used for all English horseback riding disciplines. This is a must-have in any avid equestrian's collection of tack equipment. EXCEPTIONAL FIT- contour form design to fit horses and tack of all shapes and sizes. Velcro billet keepers to prevent any shifting. OPTIMUM COMFORT - provide your horse with soothing relief with four removable shock-absorbing pads, and soft brushed cotton underside. MULTIPLE POCKETS - Two pockets on each side containing shock absorbing memory foam that can be customized to your liking. FAVORED BY ALL DISCIPLINES - This pad can be used whether you're pleasure riding, training or competing. Endless possibilities! HALF SADDLE PAD - Size: 21" length X 12" drop. Embrace and exceptional fit with Derby Originals Contoured Correction English Saddle Pad. These pads are designed with classic diamond-quilted, soft & cozy cotton top and a smooth, brushed cotton underside for gentle contact with your horse. Create a custom fit with the four removable memory foam pads engineered to absorb shock and mold to the shape of the horse's back and your tack equipment to prevent any unwanted pinching and pressure. Utilize the Velcro billet keepers to prevent the saddle pad from shifting during vigorous training sessions, and the innovative, breathable spine to ensure optimal airflow along your horses back. This pad is ideal for horses who display 'cold back' symptoms, are building muscle along the top line, and those who undergo frequent, intense training. Elite equestrians describe this as a 'must have' for your saddle pad collection. This pad features four removable memory foam inserts engineered to correct common complications that arise with traditional saddle pads. The sponge-like characteristics of the memory foam form to the shape of the tack and horses back to provide the perfect amount of cushion where needed. Any impact and shock that occurs during riding are absorbed through the memory foam creating a smooth ride for both horse and rider.